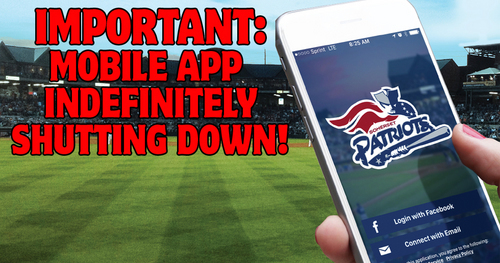 On Friday, January 18th, the Somerset Patriots, and many teams throughout the country using the company Hopscotch for their mobile app, were informed that the company is going out of business effective January 31st. This announcement was a surprise to us and all fellow users of the Hopscotch app platform. Unfortunately with Hopscotch shutting down, the future of our very popular mobile app and its MyRewards fan loyalty program is indefinitely suspended. We are currently in the process of investigating other options that will allow us to continue to provide an app and MyRewards program at the high standard our fans have come to expect of our team. Know that we are just as disappointed as all of you, as we have all invested a lot of time and effort into building a very successful and engaging app for everyone to enjoy. We had a lot of great plans to use the app and the MyRewards program in some new and exciting ways this season alone. If you have already collected MyRewards Points for the 2019 season, we will find a way to honor those properly. Once we have a little more understanding of how we can proceed for 2019 and beyond, we will let our fans know any updates.